We can manufacture complete DIN rail assemblies to individual customer specifications including cutting to size slotted and un-slotted DIN Rail and using component DIN parts from manufacturers such as: - Allen Bradley, Entrelec, Imo, Phoenix Contact, Wago, Weidmuller, Wieland, etc. Our service allows customers the opportunity to make considerable savings in terms of production labour, procurement and inventory costs associated with stocking din rail hardware. Typical DIN rail assemblies can comprise many separate parts i.e. 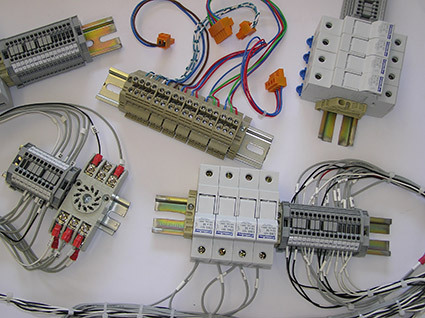 terminal blocks, ground blocks, fuse blocks, circuit breakers, interface modules, contactors, power supplies, relay bases, markers, bridges, end covers, stops, etc. Customers purchase just the complete final DIN-rail assembly under a single part number as opposed to ordering and stocking multiple individual components. The cost savings associated with a lower stock holding and reduced material waste taken together with overall production labour savings are significant. Stock Holding Reduction – only buy the final DIN assembly exactly as you require. Decreased Purchasing Overhead – less time required to order/manage components. Reduced Material Costs – no unused components, no material waste. Sourcing Convenience – easily combined with our other added value services to provide a reliable ‘single source' solution. Quality Assured – all Connect-2 Technology product is subject to 100% test/inspection.